Easy to operate and easy to read, the BD-10 measures moisture in wood and other non-wood building materials. For those who prefer an analog display, the BD-10 is a great alternative to the digital BD-2100. 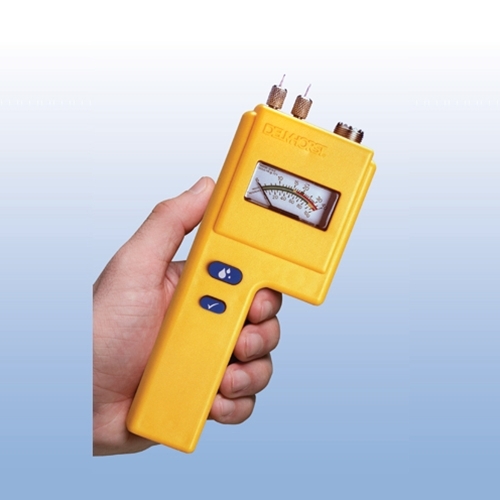 The BD-10 is a great entry level meter, and is ready to go with a single button press! With Case: Includes meter, carrying case, and extra contact pins for the meter. Order as BD-10W/CS. Standard Package: Includes meter, carrying case, extra contact pins for the meter, and 21-E electrode. Order as BD-10/PKG. Flooring Package: Includes meter, 26-ES electrode, extra contact pins for the meter, extra 496 pins for the 26-ES electrode and carrying case. Order as BD-10/26/PKG. 26/21 Package: Includes meter, 26-ES electrode, 21-E electrode, extra contact pins for the meter, extra 496 pins for the 26-ES electrode, and carrying case. Order as BD-10/26/21/PKG. EIFS Package: Includes meter, carrying case, extra contact pins for the meter, 21-E electrode, (2) 608/001 contact pins and HP-1 hole punch. Order as BD-10/EIFS/PKG.